The grasslands of Africa are the setting for African Simba, a safari themed video slot powered by Novomatic. Played using a 5 reel, 243 ways to win game engine and available on desktop and mobile, it comes with a bonus feature that awards up to 24 free spins with all payouts trebled. Join the wild animals from between 50p and £50 per spin. We’re not always complimentary about the design of Novomatic games but the visuals in African Simba are actually pretty good – set against a savannah style backdrop the reels include A to 9 playing cards as well as a range of wild animals. Look out for a bright pink flamingo, a pair of meerkats, a bison and a giraffe which is the highest paying symbol, awarding 5,000 coins for a 5 symbol combination. Appearing on the middle 3 reels only, the mighty lion is the game’s wild. It doesn’t offer any payouts but replaces all other symbols bar the scatter. The Mount Kilimanjaro symbol is the scatter – when it hits on reels 1, 3 and 5 on the same spin, you’ll trigger the Free Games feature. Here you’ll be awarded a dozen free spins. Better still, all winning combinations created during the free spins are boosted by a 3x multiplier and trebled. You can re-trigger more free spins too if you’re lucky enough to land 3 more Kilimanjaro symbols giving you 24 free spins. The visuals are a step up from Novomatic’s norm and the features are typical of the developer too. It’s a straight up free spins feature where the trebling multiplier can have a big impact. Keeping things simple certainly works here. As far as variance goes, this is in the medium to high range. You won’t be waiting ages to land a winning combination but you’ll still have a shot at pocketing a decent prize courtesy of the free spins. 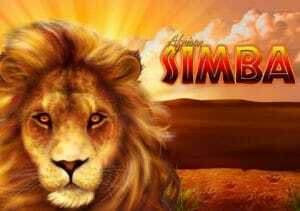 It may not be an all-time great but African Simba is a typically solid and entertaining offering from Novomatic. Get lucky with those free spins and multipliers and you could be feeling like the king of the jungle. If you like lion themed slots, White King by Playtech is recommended.